Subtitles: English, Spanish, French, Spanish 2. Menus: The menu system is EXTREMLY upgraded and ten times better than S1's interface. Unlike S1 or S2, the menus are not static and have a very enjoyable intro on each disk. It's very entertaining to watch until the episode list loads. Once it loads, there are many different objects (most of the time, space ships) flying around the screen. I personally love the moving menus, it's done very well and are quite enjoyable. On top of those two features, new sound bytes from the main voice actors are played randomly while you make your episode selection. 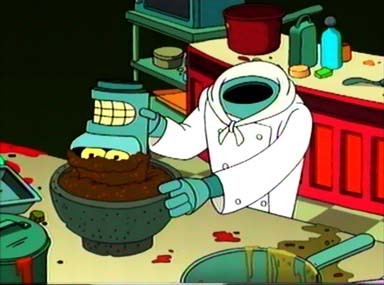 This might not sound like much, but when you get a new 'yo momma' joke out of Bender, it makes all the difference. Packaging: The packaging isn't that great. The R2 version is much more sturdy and, in my opinion, more sleek looking. The slim DVD cases are hard to use, flimsy, and don't do that great of a job protecting the DVDs. The holder of the slim cases is made out of cardboard, and can be bruised very easily. But, this isn't about packaging, is it? It's about watching Futurama on your DVD player. A week has passed since the Futurama Season 3 DVD set was released. So it's time to have a closer look at it. After fetching my imported amazon.co.uk copy from the local post office and walking it home (postmen always come during university lecture hours), edel and I ripped open the extra big carton and the next few hours were already spent. with a flimsy but nicely designed slip-over plastic cover showing Fry, Leela and Bender in space. Their helmets are transparent and give visual way to the inner carton box. The design of that is again great, but sadly, they reverted to the dent-prone unsturdy cardboard used for the Futurama Season 1 DVD set instead of the robust one seen in the Season 2 DVD release. It might be best to use the slip-off and cardboard cover for decorative purposes on your shelf only and keep the 4 separate plastic DVD cases away from them. Speaking of which, put next to each other, the cases show a nice picture of giant Bender floating in space with several details hinting at other Futurama episodes included in this DVD set. Some people have complained about the "push & click" mechanism used to hold the discs in place which makes putting them back a challenge. The trick is to have a thumb to the right and left of the middle hole and quickly push the DVD down. On to the discs, we see the lengthy legal statement for 3 countries followed by one for aliens. If you're too lazy to translate this one yourself, try skipping to track 35 on your remote. The well-known FOX logo turns up and vanishes again to switch to a fake rating and then on to the animated menu. Each disc has its own original ~10 second intro fading into the episode selection screen with the Futurama theme playing in the background. The sub- and scene selection menus are all pretty much the same for all episodes though. A new and sought after feature missing from the previous two DVD sets will play all episodes on the discs, one after another. On the language side, for the first time we not only find English, but also French listed on the box. 12 of the 22 episodes (the ones before FOX's Futurama season 4) are present in both languages. Also, the subtitle selection got a huge boost, featuring French, Danish, Finish, Norwegian, Swedish and English for the hearing impaired. Now for the main part of the DVD set: the actual episodes. With 22 of them, this is and will be the biggest Futurama DVD set - ever. And just as big is its quality range. We got a few suckers (no names shall be given), but also some of the highest ranking episodes of all time. Readers at CGEF ranked 'Luck of the Fryrish', 'Parasites Lost' and 'Amazon Women in the Mood' first, third and fifth best Futurama episodes respectively. Other gems include the Emmy and Annie-winning 'Roswell that Ends Well', the WGA-winning 'Godfellas', and the (in our opinion) heavily underrated 'Time keeps on slippin''. Together the 22 episodes come to an average of 78,5% according to our reader reviews, with about 3 ignorable episodes pulling the overal season rating down. The chart to the top right gives you a detailed overview on this. For laziness reasons, the pictures to the left are taken from our frame grab archive and do not represent the DVD quality. As for the picture and sound quality, there's little to say. Taking advantage of the digital mastering used in Futurama, the DVDs deliver superb full screen (it's a TV series after all) pictures with rich colours. No compression artifacts to be seen either. The sound is Surround 2.0 only as that's how Futurama is recorded, but Tyng's orchestra themes make it full and lively. The sound quality of one of the easter eggs is rather low but forgivable. But what would a DVD box set be without the extras? Not much, but that's what they thought, too. Each episode features its own full length commentary audio track along with a 23rd one focused on the animation aspects of 'Roswell that Ends Well'. This time around, the directors, writers, voice actors and producers seem a bit more enthusiastic about all these ~500 minutes and they tried to have more people commenting on them. Even 'lesser' episodes are well worth the watch with these on. Our DVD player sometimes didn't adhere to our sound selection at first and had to be set to it again using the on-screen audio menu. Might just be us. Each disc contains several deleted scenes, adding up to a total of about 15 minutes of unaired material. A gallery shows images of new characters and another one has 9 animated 3D models with audio commentary explaining their creation and functions. The animatics (a rough draft version of the episode) is from 'Anthology of Interest II' this time. This gives a nice look at how episodes come together. You'll notice how Amy's and Leela's voice actors weren't available for this stage of production with others - including David X. Cohen - filling in for them. Also, this animatics hasn't yet seen the FOX TV censor desk, allowing us to see human Bender wiggle his antenna. comes with a comic-like and annotated pre-animation storyboard. Another extra explains how to draw Leela and Fry in multiple steps and from different angles. As disc 4 seemingly wasn't full yet, trailers for the Futurama video game and previous season box sets were added along with some international clips. As you already bought Season 3 once you go through these DVDs, there is no trailer for that one, but you can see it online at fox.co.uk. whether you want to click on the links below or try to find them yourself. We still just had to show one single picture featuring David X. Cohen and 'some guy'. To sum things up, this DVD set's technical flaws regarding the box cardboard and the few not so great Futurama episodes are easily outweighed by lots of great ones and extra features even beating the Futurama Season 2 set. Well worth the money for fans and soon-to-be fans. The Futurama Season 3 set is currently available online at amazon.co.uk at 25% off for £30 and at amazon.de for €54. The US version is on sale starting March 9th and available at amazon.com for around $35.